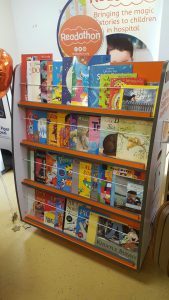 Today, Laura and Robert Bromberg went to to Gloucester Hospital Children’s Centre. 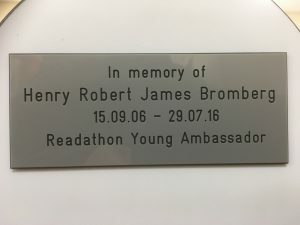 At the gathering were Henry’s grandparents; Michael Loader the storyteller (who was such a great pal of Henry); staff from Readathon and some hospital staff who knew him well. 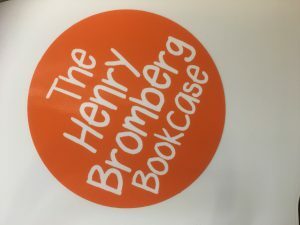 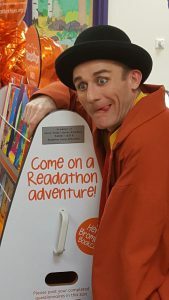 A brand new Readathon bookcase was being donated to the hospital in Henry’s name and was presented by another great friend of Henry, Tweedy the clown (who is currently hosting ‘Jack-In-The-Beanstalk’ at the Everyman Theatre in Cheltenham). 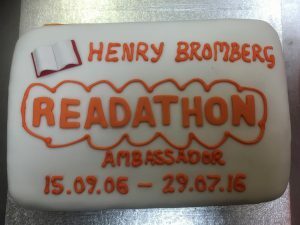 It was a very positive, upbeat occasion in keeping with Henry’s character and a lovely cake was made by Clair Drew for all who were there including staff and children staying at the hospital. 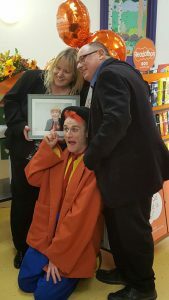 Michael the storyteller and Tweedy then went round the ward entertaining the children , with their differing and wonderful varieties of hilarity.